ASX listed gold junior Great Southern Mining has wasted no time coming to grips with its flagship Mon Ami gold project in the northern Goldfields of WA, this week reporting a maiden mineral resource for the new discovery. The inferred mineral resource estimate of 1.1 million tonnes grading 1.7 grams per tonne gold for 59,000 ounces comes only 8 months since the company acquired the project earlier this year. Great Southern said the new resource has been delineated at a tiny cost of less than $15 per contained ounce and specifically excludes gold mineralisation below a vertical depth of 150m at this stage. The company has also instigated metallurgical test work studies on the Mon Ami ores, with an eye to producing a future ore stream from the project for toll treating at suitable processing facilities nearby. Great Southern has established itself at a wonderful address, surrounded by behemoths such as Sunrise Dam and Wallaby, that contain 25 million ounces of gold between them. The nearby Mt Morgans, Lancefield and Granny Smith deposits all contain more than 1 million ounces and Great Southern would take that future gold endowment from Mon Ami in a heartbeat. The project lies within the Laverton tectonic zone and is located near the regionally important Barnicoat shear zone, which is dotted with numerous gold deposits, including the abandoned Barnicoat open pit mine initially developed by Sons of Gwalia in the late 1980s. Great Southern are hot to trot at Mon Ami and has already received approval for a follow-up drilling campaign and plans to undertake an extensive program of infill and extensional work aimed at increasing geological confidence of the deposit and prove up further gold ounces. There is considerable blue sky exploration upside at the Mon Ami project, with the maiden resource estimate constrained only by drill coverage at this point. According to the company, there is a significant number of other gold intersections outside the current resource limits that do not presently have sufficient drill density to support classification as new mineral resources. These areas represent high priority target zones for Great Southern in the upcoming drilling programs. The company is also in the process of acquiring four other exploration licences in the district, including one that surrounds the Mon Ami deposit to the south and east. Other potential acquisitions cover prospective looking structural corridors to the southeast of Mon Ami, which appear to have had no historical exploration activity of note at all. Mon Ami is located about 10km east of Gold Fields’ Granny Smith underground gold mining operation and 25km southeast of the Laverton township. Mineralisation is hosted by iron-rich quartz veins in discrete lodes that have been defined over a strike of 400m thus far. At present, little definitive drilling has been completed below 150m depth at Mon Ami, although narrow intersections of mineralisation have been recorded in the past. Outside of WA, Great Southern is exploring for gold, silver and copper mineralisation across a number of separate 100%-owned exploration licences in northern Queensland. 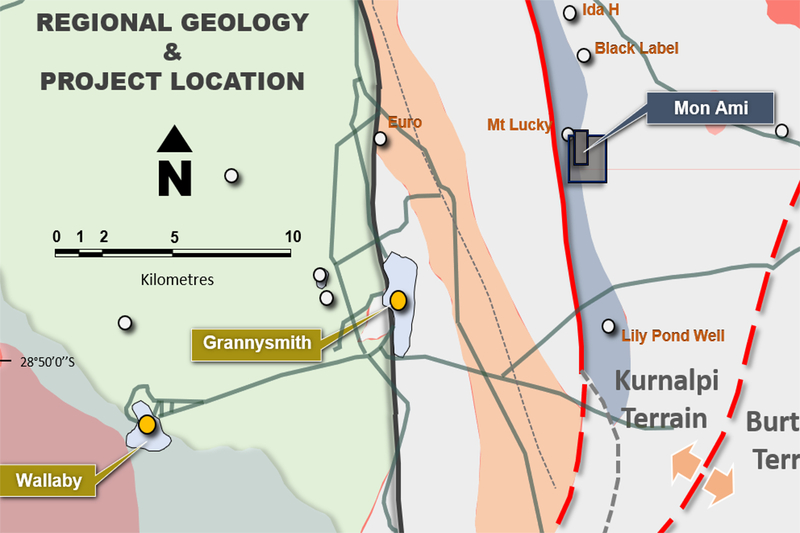 The company’s main Queensland project tenements are located close to Evolution Mining’s low-cost Mt Carlton epithermal gold mining operation. Recent field work unearthed rock chip samples of up to 1.65g/t gold and 185g/t silver during a first pass geological reconnaissance exploration program at the Edinburgh Park project, just 25km north of Mt Carlton. In the meantime, Great Southern has its hands full developing the Mon Ami gold project and a potentially expanding portfolio of gold tenements in this prospective and under-explored part of WA’s northern Goldfields.